What Will Be The Undoing Of The Superhero Movie? So let's see. According to this Indiewire article, there are 23 comic book movies due out over the next four years. (Well, technically 22, now that Guardians of the Galaxy is out.) That's seven Marvel films, seven from DC, five from the Foxverse of X-Men and the FF, and four Spidey-related movies from Sony. That's a lot of money, and, apart from the ever-lucrative Marvel Cinematic Universe, it remains to be seen if any of these other movies will become hugely profitable franchises. Sony's Spideyverse, for example, is increasingly looking like less of a sure thing. The second Amazing movie did well, but it wasn't the Avengers/Dark Knight-sized blockbuster that the studio was hoping for. (That's probably why they've really been pushing the new Blu-Ray disc — with over 100 minutes of extras, you guys!) Sony intends to go forward with a Sinister Six movie, but given moviegoers' tepid response to the villain-stuffed ASM2, it doesn't seem like that much of a great idea. ASM3 was going to be Sony's summer 2016 tentpole, but it appears to have been pushed back to 2018. If Sinister Six flops, or fails to materialize, we might be looking at another reboot. Over at Warners, there's been an explosion of activity in regards to their superhero properties. Batman v Superman, rather than being a straightforward team-up story, now appears to be a showcase for multiple costumed characters with superpowers, many of whom might later get movies of their own. It's clear that the studio desperately wants a multi-platform superhero franchise along the lines of Marvel's cinematic universe, but without the studio's long-term approach to vetting its characters with audiences before going ahead with The Avengers, it seems like a recipe for potential disaster. Man of Steel, the inaugural movie in DC's cinematic universe, was fairly successful, but likely fell shy of the studio's expectations, especially after the massive success of the Nolan Bat-films. 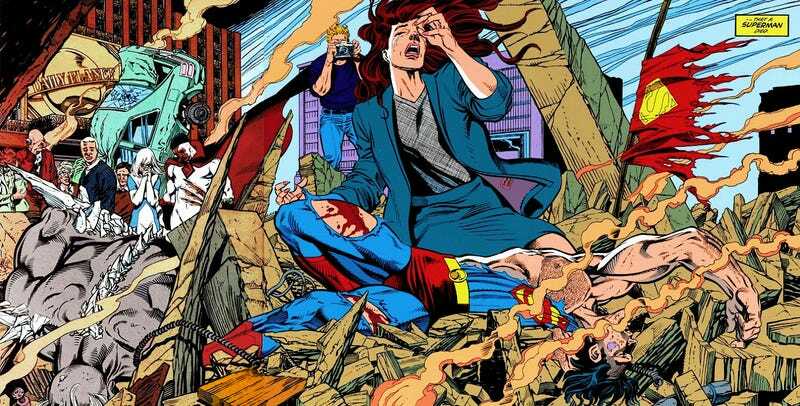 If BvS underwhelms, a JLA movie seems much less likely — or it might end up being an all-or-nothing, last-ditch effort. As for Fox's properties, well, Days of Future Past did well, but none of the long-running X-movies' stars are getting any younger — and seeing as how the mutant franchise has largely been a vehicle for Hugh Jackman and Patrick Stewart, that's not a good thing. After Age of Apocalypse, expect a reboot of some kind. There's also FF, which is a reboot of a series that nobody much liked, and apart from some racist fanboys on Twitter, hasn't generated a whole lot of buzz, positive or otherwise. So what will be, or could be, the superhero movie's Heaven's Gate? Note that I say "superhero" and not "comic book" movie — at this point I think studios are making a big distinction between the two. (Nobody would think of 300 or Sin City as "superhero" movies, after all.) Guardians of the Galaxy was sold as a Marvel movie first, and a space opera action movie second — not as a superhero movie, because duh, there really aren't any costumed heroes in it. Disney realizes that at this point, the Marvel brand is bigger than superheroes, and can pretty much sell any kind of hero or story. (Expect the Doctor Strange movie to play up the supernatural fantasy/horror aspects of the character, rather than traditional superhero action.) That's a lesson that the other studios have been slow to learn — especially Warners' all-Batman, all the time approach. Everybody seems to want their own universe, but nobody seems to have the patience or the understanding as to how to build one.